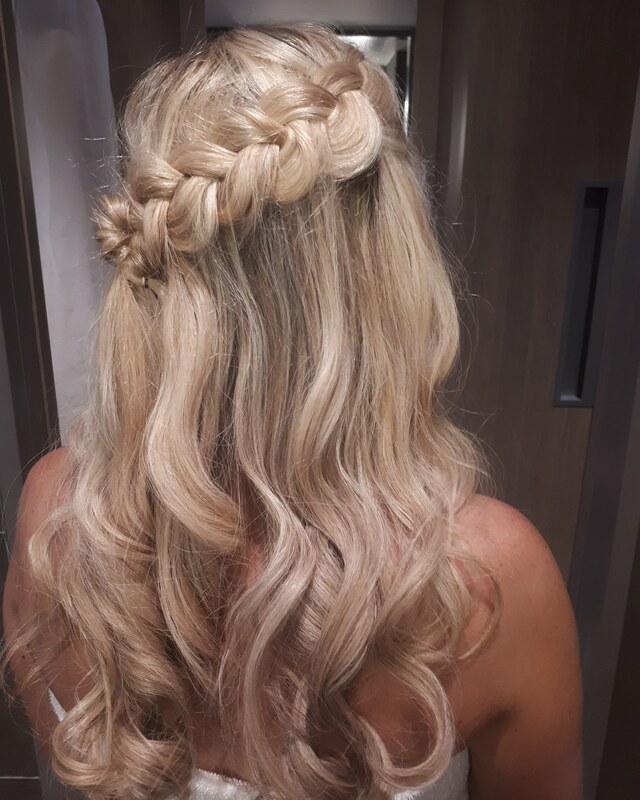 My approach as a wedding hair stylist is completely bespoke to each client I work with. Your hair on your wedding day needs to reflect who you are, and the sort of big day you’re planning. It needs to perfectly complement your dress, and fit in with the venue and décor choices you’ve made, while keeping you feeling comfortable as well as polished and drop dead gorgeous! There’s no magic formula for that, and each look I design is unique to the bride it’s created for. However, I am seeing certain sorts of styles being requested over and over again. The soft, romantic and slightly bohemian-inspired bridal look is a trend that looks like it’s here to stay. Needless to say, I’m pretty thrilled; as these are exactly the sorts of styles I most love to create. This beautiful style has a timeless feel to it. Soft, textured curls at the back with a small amount of volume. 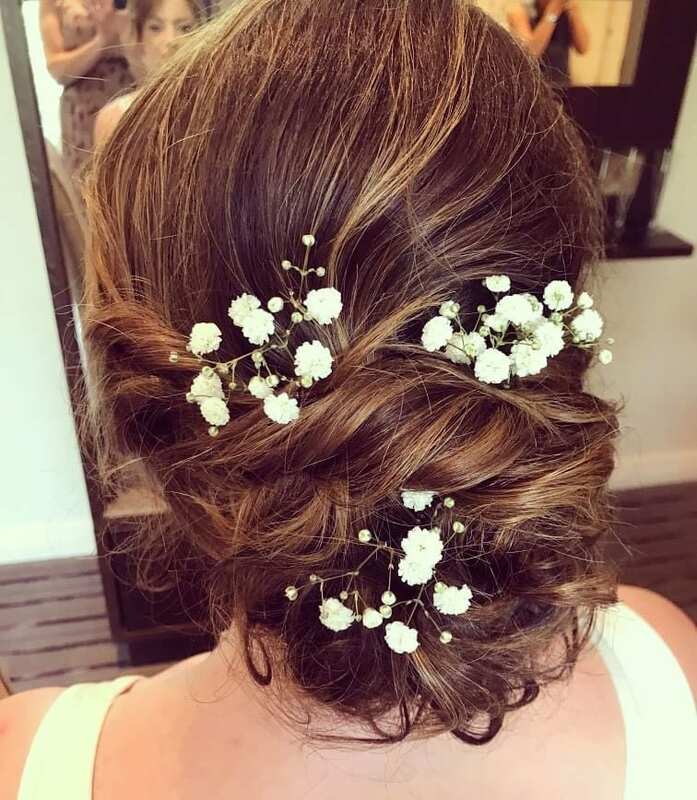 Adding a pulled out front braid gives this look a more rustic feel, perfect with a small amount of frothy white blossom gypsophila, also known as baby’s breath. This more elaborate style can really make an impact, while still remaining natural looking and romantic. 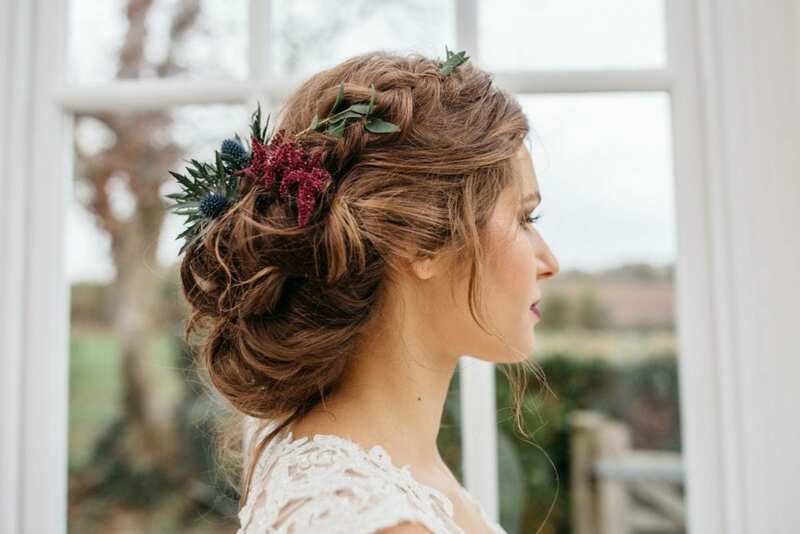 If you’re a bride with several colours in your hair, this style is perfect for you. It’ll really pop! I sometimes use natural hair extensions with a style like this to add depth, texture and volume. I’ve seen a big trend for buns on my brides this year. 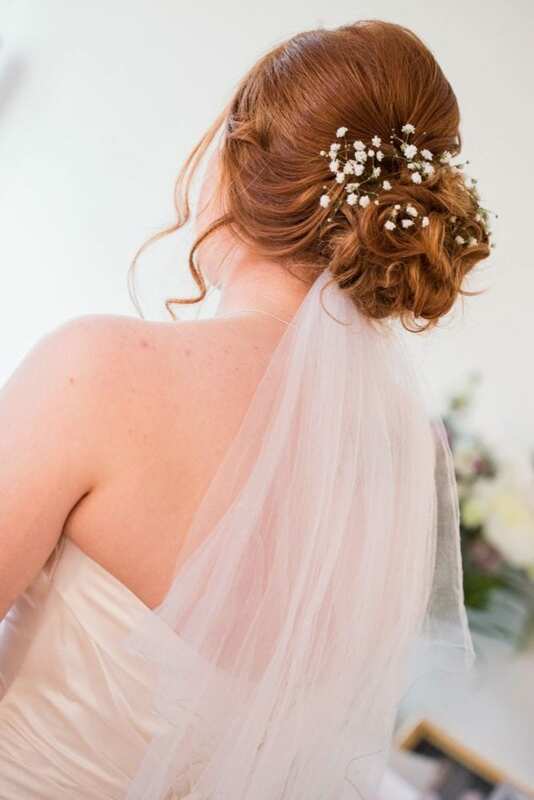 I’m not talking the sleek, high and tight buns that wouldn’t look out of place on a prima ballerina; instead, these bridal buns are a lot looser, softer and more artistic. This style has been popular with my brides looking for a less rustic and more polished finish. It works beautifully on thicker hair. The style is a much softer version of the top bun with less height and a more natural look, feel and finish. Adding a few natural flowers, such as small roses gives this a softer more romantic feel or you can dress it up with a sparkling hair vine. This look has a luxe feel to it and it’s wonderfully versatile. Elegant and gorgeous on its own, it can also be adorned with some simple hair jewellery, a comb or a delicate veil. 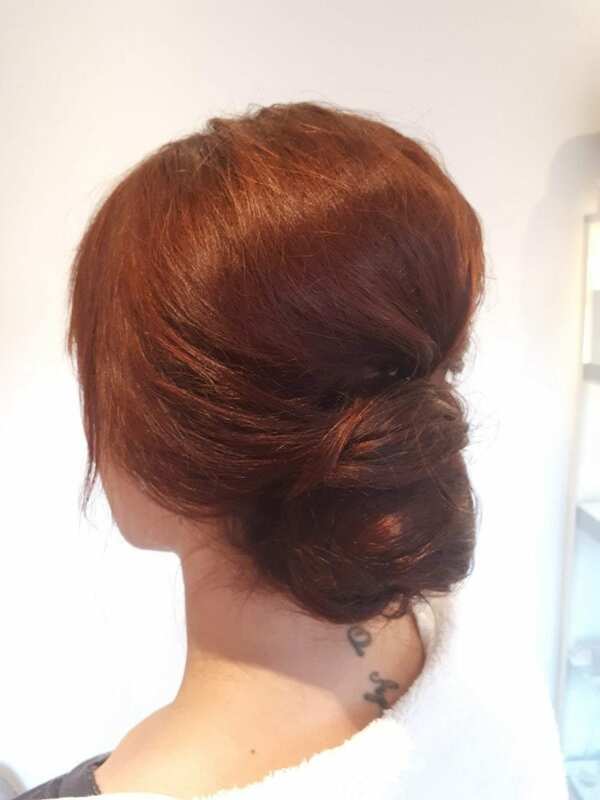 A more textured pulled out version of the soft bun above, perfectly suited to an outdoor, rustic or festival wedding. The position of this style near the nape of the neck makes it perfect for a statement hair accessory or jewelled vine. This is one of my favourite styles to create. I love combining different braids to give this relaxed, bohemian and seriously textured look. This style is perfectly suited a dress with a swooping low back, as the eye follows the braid down. Why not add a feature finish with small vines, pins or even fresh flowers? This is a softer, more romantic version of the ever-popular half up half down style. The a-symmetric chunky braids add an edge and really draw the eye – it’s quirky and beautiful and I just love it! 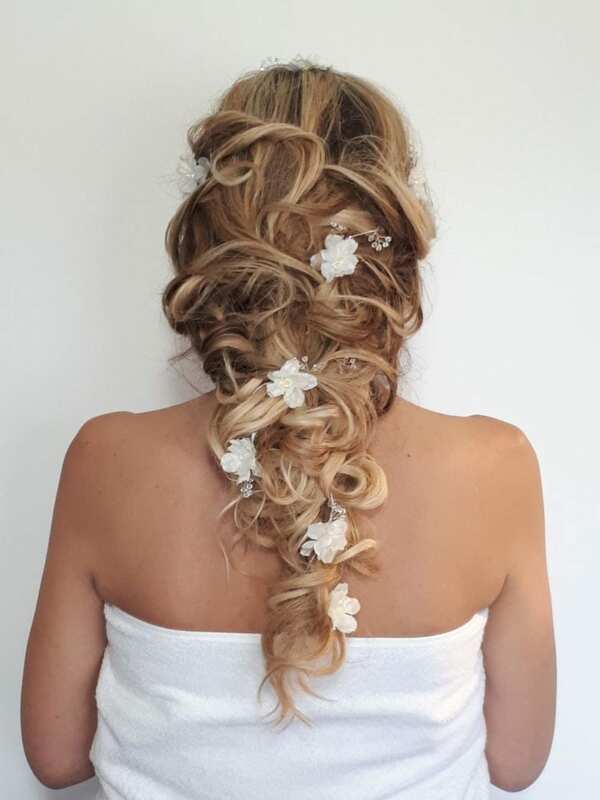 This style looks stunning on its own or can be finished with a splash of colour from some fresh flowers. Which of these styles is your favourite? 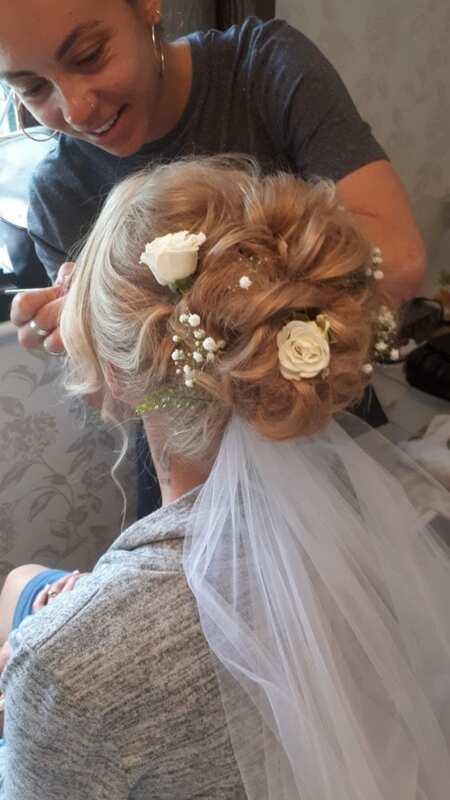 If you’re looking for loose, natural and whimsical hairstyling on your wedding day, then why not give me a call? I’d love to chat to you about your plans.